As well as reading this blog there are some other ways to keep up-to-date with the RSS James Clark Ross during my cruise. The NOC Oceans For Schools site (maintained by Val Byfield) has put up a special Drake Passage Page for the cruise. This afternoon I have started packing, or making a pile of everything I think might be useful. This currently includes a swimming costume, lots of university work and a fleecy rainbow hat. I have 54 kg of baggage allowance, if I use it all I don’t think I’ll be able to get to the airport! Q. Will you see many Polar Bear? Q. Have you packed enough warm clothes? A. I hope so! The same time last year (mid November to mid December) the temperature were generally much higher in the Southern Ocean than they were in th UK. The mean monthly temperature for December at Rothera Research Base, the most southerly point I will go, is above freezing. The mean minimum temperature for Durham in the same month is only a few degrees higher. Q. Will you see the midnight sun? Probably! Rothera research base is within the Antarctic Circle and so experiences 24 hour sunlight for part of the summer. I’m not yet sure if it will be when I am there. Q. Will you see the Southern Lights? A. The Southern Lights (or aurora australis) are usually seen only during the Antarctic winter, March to September. In the summer the pole experiences constant daylight so the aurora cannot be seen. Q. Are you looking forward to seeing water going the other way around the plug? A. Actually the way that the water goes around a plughole is controlled by the shape of the sink. It doesn’t go the other way in the Southern Hemisphere. Large ocean currents flowing around the ocean basins (called gyres) do spin opposite directions due to the Coriolis Force, clockwise in the Northern Hemisphere and anticlockwise South of the equator. This force is too weak to impact small scale motion. If the sink was reeeeeeally big then the spin of the water would act like in the oceans – click here if you don’t believe me or want to know more. Q. 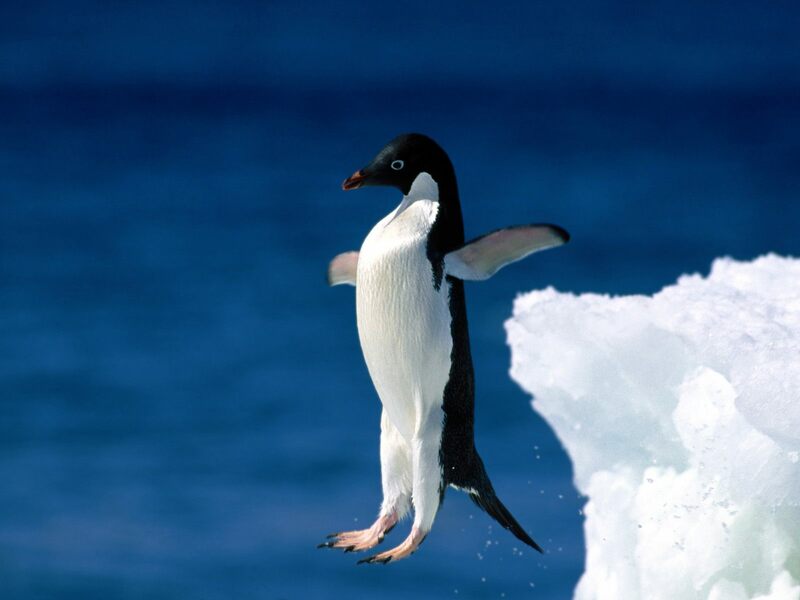 Can you bring me back a penguin? Q. Where will you sleep? A. On the boat! It will take about a week to cross the Drake Passage. What do I do if there’s a spider on board? In my first blog, ‘going to see the penguins‘, I discussed why I am going to the Southern Ocean. Today, with just a week left before I leave the UK, I am going to explain a bit more about what I will hopefully be doing when I get there. Next Sunday I will start the long journey to RRS James Clark Ross. After joining the boat at Port Stanley in the Falkland Islands we will head South, spending 10 days crossing the Drake Passage to the Antarctic Peninsula. 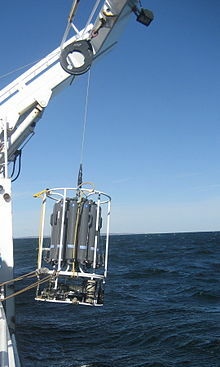 It is on this leg of the journey that temperature, salinity and density readings will be taken using a CTD (conductivity, temperature, density) device – like that shown in the picture further down. This is dropped over the side of the boat and lowered into the ocean taking readings and water samples at different depths. The data collected can be used to produce sections like those shown above. These were generated from data collected from 30 stations across the Drake Passage on the 2008 cruise. They show the properties of the water from the Falkland Islands on the left to the Antarctic Peninsula 700 km along on the right and from the sea surface down to the sea floor. The salinity profile, on the left, shows the most salty water stretching from the sea bed at the northward end of the section to the mid-depths closer to Antarctica (the dark red area). The least saline waters, which are less dense at the same temperature, lie on top of more saline waters. Globally, ice melt and river input cause decreases in salinity, evaporation causes an increase. The middle plot is a temperature section showing that the warmest temperatures are found nearer the surface and closer to the Falkland Islands. Naturally, the sea surface temperature is greatest close to the equator and the closer to the poles we go the colder the surface waters become. At depth there is less variation in temperature – a chilly sub 3*C globally. Density, the far right plot, is controlled by a combination of salinity and temperature – so we see similar patterns here as in the other two. Areas of sudden change in the above plots signify ‘frontal feature’, where currents will flow faster. When the changes are gradual flow is steady across the area. By collecting data every year changes to the gradients, showing changes to the flow, can be monitored to identify long term trends such as currents speeding up or changing location. These changes can be used to infer the mechanisms of climate variation. Once we get to the Antarctic Peninsula we will be stopping at Vernadsky, Rothera, Signy and Bird Island Research Bases, dropping of supplies, equipment and scientists as we go. My job will then be to start writing up the data we have collected, and attempting to catch-up with the lectures and assignments I am missing so I still have a job when I get back to Reading! Then we head back to Port Stanley and on to the UK, hopefully in time for Christmas! In a few weeks’ time I am flying to the Falkland Islands to participate in a scientific cruise crossing the Drake Passage to Antarctica. We sail from Stanley, one of the last remaining outposts of the British Empire, to the British Antarctic Survey base of Rothera then back via other British Antarctic Bases. I’m going to use this blog to keep you updated about what I am up to and show-off what I have seen. First I should explain why I am going. I have recently completed an M.Sc. degree in Physical Oceanography and Climate Dynamics, for which I completed the research project calculating the rate of flow through Drake Passage between the Burwood Bank just South of the Falkland Islands and Elephant Island just off Antarctica. This was used to produce a time series of (water) transport through the Drake Passage between 1993 and 2008. The Drake Passage marks the narrowest point of the Southern Ocean. As there is no land between South Africa, South America, Australia and Antarctica the Southern Ocean reaches all the way around the Earth allowing the flow of the strongest global ocean current – the Antarctic Circumpolar Current. Because the Drake Passage is the narrowest point it is a good place to measure the Antarctic Circumpolar Current as the flow is constrained so we can be sure that the current in its entirety. So why do we want a time series of total transport through the Drake Passage? How will my study influence the larger scientific community? We need to look at why Drake Passage is important globally. Global ocean circulation is comprised of surface currents, regions of deep water formation where the surface waters sink, deep water currents and upwelling regions bringing deep waters back to the surface. Changes to the rate of any of these would lead to changes to the rate of global overturning circulation, forcing the others to change. It is currently thought around half of all global upwelling occurs around the Antarctic Circumpolar Current, the rate of which is controlled by the rate of flow of the current. Transport through the Drake Passage is, therefore, a measure of the rate of upwelling. Trends in transport (changes to the rate of flow) may suggest changes to ocean currents all over the Earth, known as the global overturning circulation. This global ocean circulation influences the global climate, for instance causing the mild climate of Britain compared to other regions at the same latitude. If the Antarctic Circumpolar Current can affect the global ocean circulation it could have an impact on global climate, therefore monitoring changes in the current is of great important. To calculate transport through the Drake Passage vertical profiles of the temperature, density and salinity are required from several locations across the Drake Passage. Since 1993 annual oceanographic cruises have taken place, taking readings from at least 30 locations (‘stations’) across the Drake Passage. The cruise I am going on will collect this data to continue the annual time series. *I don’t know yet, but if I do I won’t bring you one back, sorry!